The moon and the earth were bombarded by many large and small meteorites and comets during the first 500 million years of the Solar System. The earth has about 180 identified impact craters. In contrast, the remains of thousands of impact craters are visible on the moon. The moon's surface is comparatively static, while earth's surface is an ever-changing system with plate tectonics, mountain formation, and erosion. Inundated by oceans and fresh water. 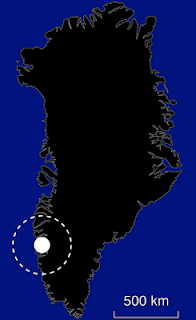 The remains of a 3000 million year-old meteorite impact was discovered on the western coast of Greenland in 2009 by a GEUS geologist. The crater impact structure found near the town of Maniitsoq is about 310 miles wide. Until the discovery of the Maniitsoq impact crater, the 2020 million year-old, 186 miles wide Vredefort crater in South Africa was believed to be earth's oldest (and largest) impact structure. The remains of a gigantic, three-billion-year-old meteorite impact discovered in Greenland, June 28, 2012, GEUS. Geological Survey of Denmark and Greenland - GEUS. List of impact craters on Earth, Wikipedia. Pictures of The Biggest Impact Craters on Earth.